Dr Jengo's World: More Stuff from SDCC 2013! You didn't think it was over yet, did you? Of course not... Here's more stuff that has caught my attention from SDCC 2013! 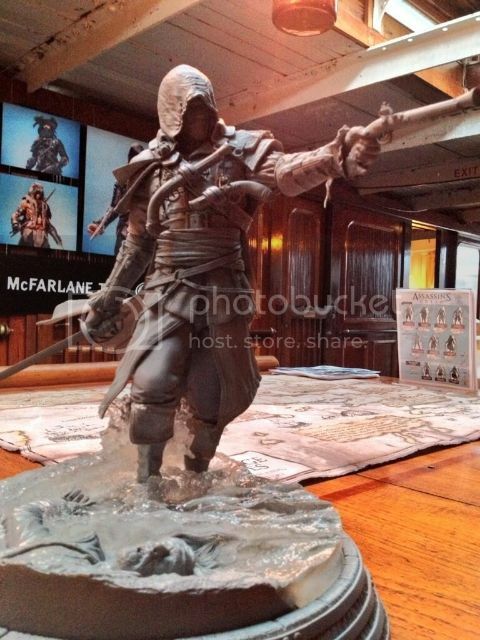 The rumoured Edward Kenway statue from McFarlane has been revealed. Taken from The Slanted: Todd McFarlane was on-hand to make a few announcements, “For the first time since I’ve been making toys, we’re including rewards with each figure you can redeem in-game,” he said. McFarlane then displayed a 15-inch tall Captain Edward Kenway figure with a translucent water detail. Looks pretty cool, just crossing my fingers that the final painted version will be quality. Of course, hoping the price would be reasonable too. Very cool pose showing off all his weapons; pistols and the cutlass, walking through water. A closer look at the pic also shows a very interesting pic on the right. A total of 11 Assassin's Creed characters which presumably are the action figures. The first row is definitely the Series 1 of figures from McFarlane Toys. Second row looks to be the Series 2 with Capt Blackbeard at the right. The 3rd row is a mystery for now. Anyone has a closer pic of that ad? I'd be most interested to find out what else is in store. I already did my pre-order with a friend who is bringing in the figures to Singapore so I'm pretty excited for the line. Also curious to see what bonus in-game content for AC IV they will be including in each figure. Oh and remember the new Assassin's Creed Brahman comic that was announced, Joystiq has some preview images of the comic. Do check it out! This never gets old! With MK Legacy Season 2 in September, MK figures and statues coming out at the end of the year and a movie in the works, Mortal Kombat is finally getting the love it deserves. That's all for now. I'm pretty sure I missed out something but can't seem to remember right now. Crap, I'll make another post when I can remember what that is. See you guys again!